Multiple devastating suicide bombing attacks were reported over the span of 24 hours in the northeastern Nigerian city of Maiduguri killing nine and wounding upwards of 13, of which most were civilians. The attacks came after the Muslim holy month of Ramadan had just come to an end where people were flooding the streets in what is known as Eid al-Fitr celebrations. 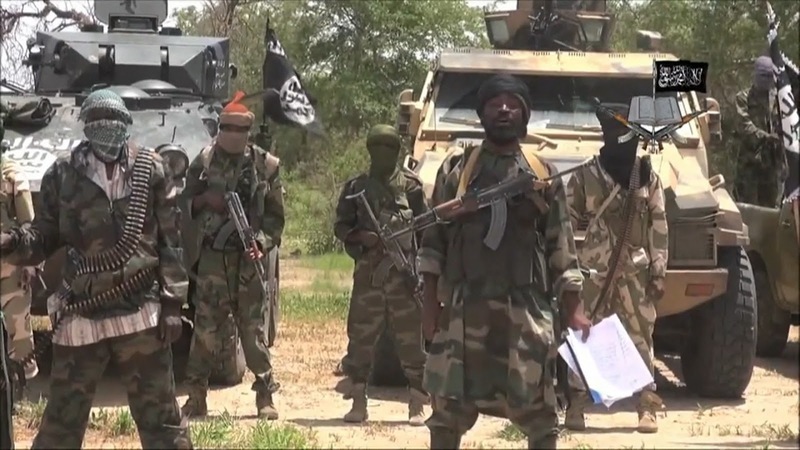 Of the several suicide bombings, four were perpetrated by female Boko Haram members. Boko Haram also attacked a Nigerian military police convoy on the outskirts of Maiduguri earlier last week where the elusive Boko Haram leader, Abubakr Shekau released a fresh propaganda video where he appears glassy-eyed and holding what looks like a stick instead of a microphone while proudly declaring his Boko Haram was responsible for the attack stating: "I want to tell you that we are the one that attacked the convoy, here are the vehicles for all to witness." The video then cuts to several scenes of Boko Haram fighters engaging what looks like a mix of military and civilian vehicles with heavy machine guns mounted on the back of camouflaged pick up trucks. Then the video cuts to graphic images of what looks like dead Nigerian soldiers and others captured tied to a stump in preparation for beheading by machete-wielding Boko Haram terrorists. THE VOICE OF BIAFRAN RABBI. HAHAHAHAHAHAH,WHAT A SAD DAY/MOMENT FOR TERRORIST MBUHARI AND ALL HE REPRESENTS IN AFRICA(ISIS LEADER).NOW THE LEADER OF BOKOHARAM /ISIS IS COOL DEAD AND INSTEAD TERRORISTS AREWA NORTH ACCEPT ALLAH'S WILL BUT CHOSE TO THREATEN ZIONISTS? HAHAHAHAHA,OH,HAUSA/FULANIS,THE GAMES AHEAD OF YOU ALL FOR THE SAKE OF NDIGBO/ZIONISTS BIAFRANS IS RATHER KEPT SECRET. YOU ALL WILL SURELY PAY DEARLY FOR ALL EVILS COMMITTED AGAINST UMU-IGBO IN THE BRITISH EXPIRED CONTRAPTION.YES,THE DISASTER AHEAD OF YOU,THE TERRORISTS ISLAMISTS IS GREAT AND ZIONISTS ARE WELL PREPARED FOR THE GAMES NOW AND AFTER BIAFRA RESTORATION. YES, YOU ALL MUST PAY DEARLY AND THIS PROMISE IS UNDER OATH AND SHALL BE DONE AS THE LORD LIVES!!! WHERE IS TERRORIST MBUHARI? DEAD AND FORGOTTEN AS THE ZION WORK CONTINUES OK.URS THE BIAFRAN RABBI.